Nifty opened positive, and stayed positive till the Union Budget started. Then it started drifting down as as Mr. P. Chidambaram read his Budget Speech. As soon as the speech ended, Nifty went into free-fall mode to break 5700 level also. The index ultimately closed at 5693.05 a huge loss of 103.85 points, the highest loss in many months. The broader market was also weak, with just 343 advances to 1161 declines. 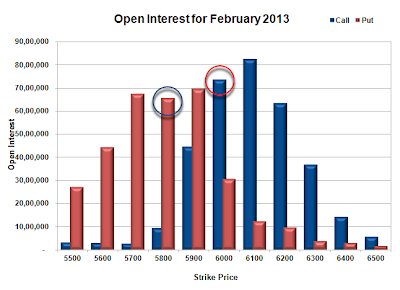 At the start of the series the OI table shows support at 5700 level. Call option 5400-6100 added 69.29 lacs huge amount of OI with small profit booking seen at 6200 strike price. Put Option 6300-5500 added 47.64 lacs huge amount of OI with small profit booking seen at 5400 strike price. Highest accumulation on Call option 6000 at 53.51 lacs & 5900 at 44.97 lacs whereas Put option 5700 at 61.61 lacs & 5800 at 51.04 lacs. 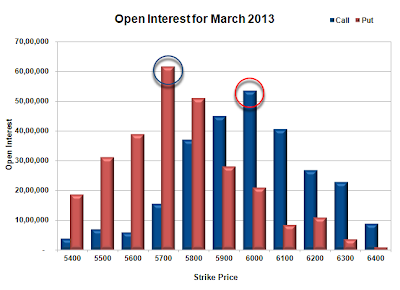 Nifty Open Interest is at 1,40,09,950 up by 25,04,650, with decrease in price, mostly rollover with huge short build-up. Bank Nifty Open Interest is at 11,81,600, up by 5,23,725, with decrease in price, 100% rollover with huge-huge short build-up. FII’s sold huge 25.96 lacs of Futures, most probably short build-up, and the average price per contract comes to around 5737. FII’s future open contract as on date is 297025. PCR Open Interest (Volume) at start of series is just above 1 at 1.007. Best support at 5700PE, with OI over 61.6 lacs and below that at 5600 with OI of just 38.9 lacs. 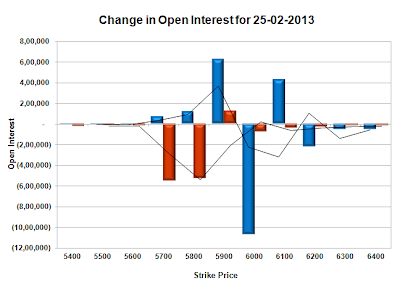 Resistance at 5900CE, with OI above 44.96 lacs, and above that at 6000 with huge OI of 53.5 lacs. 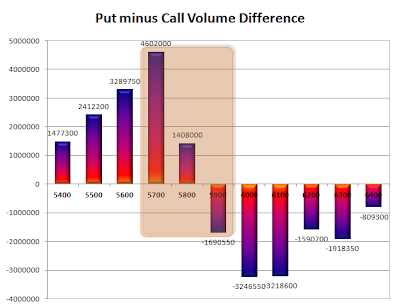 Range as per Option Table is 5683 - 5773 and as per VIX is 5649 - 5737 with 5730 as the Pivot. Nifty for a change opened positive, but the sellers came back to move the index below the previous day’s low. The resurgent buyers came back to move the index above 5800 but closed just below at 5796.90 a cool gain of 35.55 points. It seemed like a good come back on the eve of Budget, after the mayhem seen yesterday. The broader market also performed well, with 825 advances to 693 declines. As per OI table, the index is exactly at pivot level and can see either 5700 or 5900 tomorrow. Call option 5800-6000 added 10.62 lacs huge amount of OI with profit booking seen at 6100 and above strike prices. 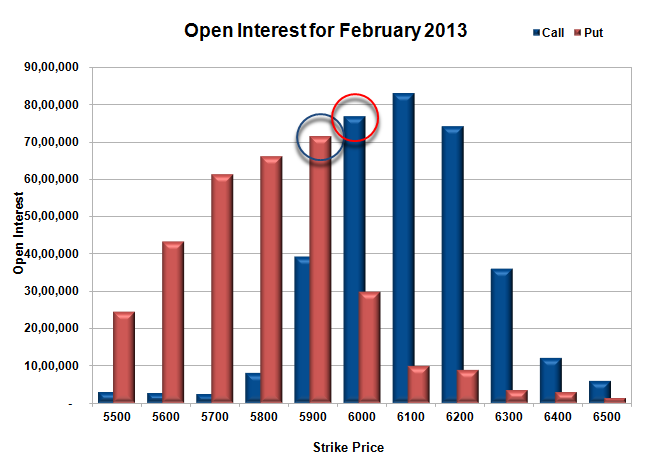 Put Option 5700 added 2.58 lacs huge amount of OI with huge liquidation seen at 5800 and above strike prices. 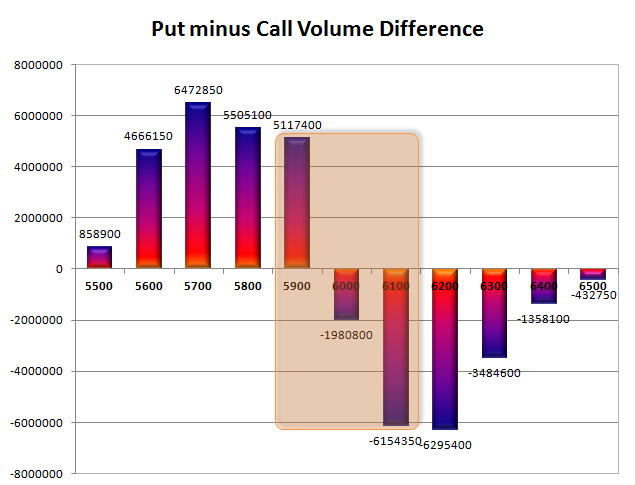 Highest accumulation on Call option 6000 at 95.6 lacs & 5900 at 83.6 lacs whereas Put option 5800 at 59.5 lacs & 5700 at 56.6 lacs. Nifty Open Interest is at 1,44,41,800 down by 6,39,100, whereas March series added 16.87 lacs with inrease in price, most probably 100% rollover with huge long build-up. Bank Nifty Open Interest is at 12,32,325, down by 1,04,875, whereas March series added 1.60 lacs with increase in price, most probably 100% rollover with huge long build-up. FII’s today mostly day traded, but their net OI increased by 38839 contract and the average price per contract comes to around 5827. FII’s future open contract as on date is 629639. PCR Open Interest (Volume) making another low and now at 0.661. Support at 5700PE, with OI over 56.6 lacs and below that at 5600 with OI of 53.7 lacs. 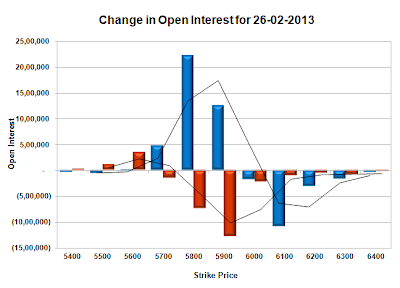 Huge Resistance at 5900CE, with OI above 83.6 lacs, and above that at 6000 with highest OI of 95.6 lacs. Range as per Option Table is 5751 - 5834 and as per VIX is 5748 - 5846 with 5800 as the Pivot. Nifty opened weak on the back of very bad global cues, and started drifting down with each passing hour to close near the lows of the day at 5761.35, a huge loss of 93.40 points. This was one of the biggest loss in the index in months. The broader market was also very weak, with just 265 advances to 1266 declines. 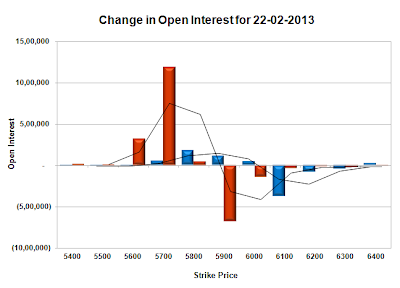 As per OI table, the range has just shifted down to 5720-5900 for the time being. Call option 5700-5900 added 39.72 lacs huge amount of OI with profit booking seen at 6000 and above strike prices. Put Option 5600-5500 added 4.59 lacs huge amount of OI with huge liquidation seen at 5800 and above strike prices. 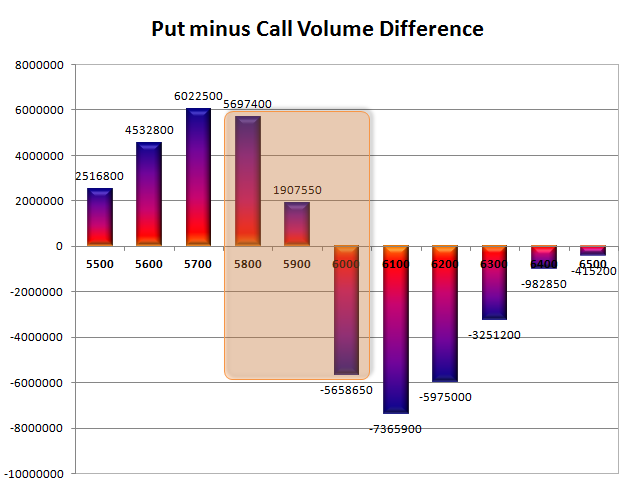 Highest accumulation on Call option 6000 at 91.4 lacs & 5900 at 79.4 lacs whereas Put option 5800 at 63.6 lacs & 5600 at 58.9 lacs. Nifty Open Interest is at 1,50,80,900 down by 7,50,300, whereas March series added 54.23 lacs with huge decrease in price, most probably 100% rollover with huge short build-up. Bank Nifty Open Interest is at 13,37,200, up by 1,00,275, whereas March series added 1.86 lacs with decrease in price, most probably huge short build-up in both series. FII’s sold huge 21.79 lacs of Futures, most probably short build-up, as their net OI increased by 177542 contract and the average price per contract comes to around 5792. 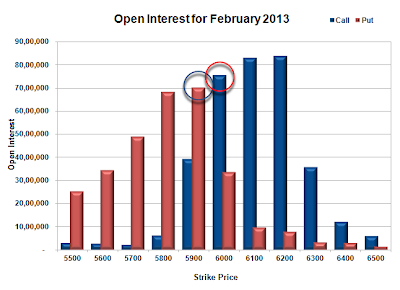 FII’s future open contract as on date is 590800. PCR Open Interest (Volume) at the low point of the series at 0.718. 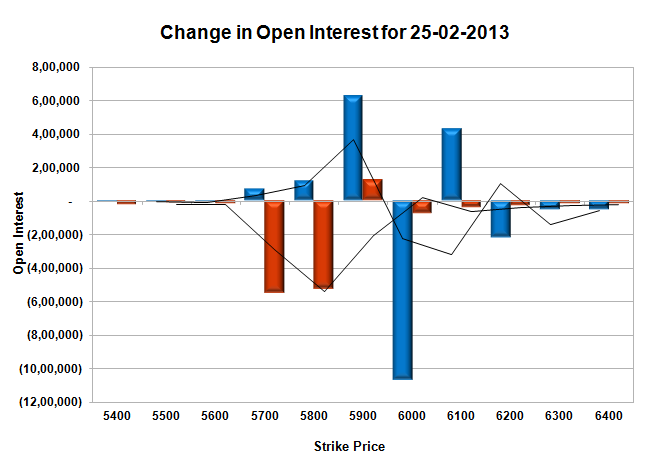 Support now have gone down to 5700PE, with OI at just 54 lacs and below that at 5600 with OI of 58.9 lacs. Huge Resistance now at 5900CE, with OI above 79.4 lacs, and above that at 6000 with highest OI of 91.4 lacs. 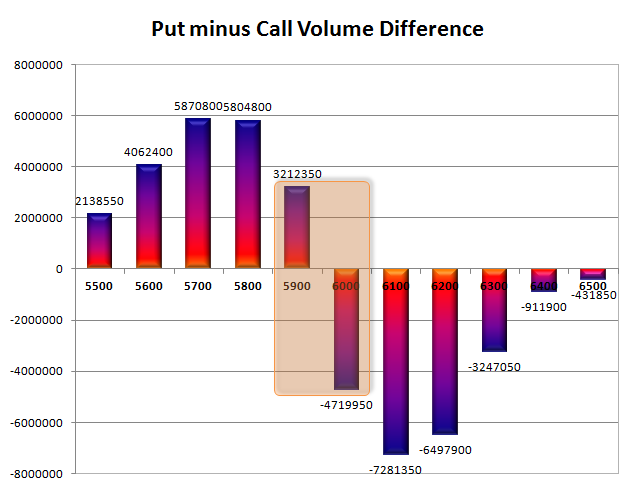 Range as per Option Table is 5738 - 5818 and as per VIX is 5709 - 5814 with 5790 as the Pivot. Nifty opened weak and saw a dip towards 5835, but the responsive buyers took control and moved the index to the highs of the day around 5875, but weekend profit booking saw the index close flat at 5850.30, a small loss of 1.95 points. On a week-on-week basis the index lost 37.10 or 0.63%, a continuous loss of 4 weeks. The broader market was also flat, with 740 advances to 752 declines. 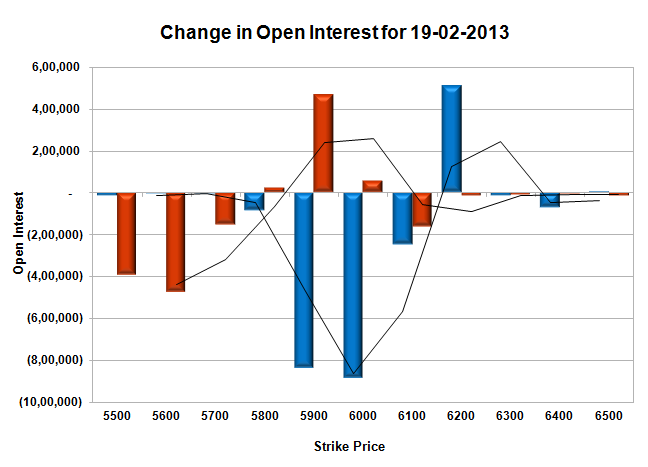 As per OI table, the range of 5800-5950 could come in the play for the next 1-2 days. 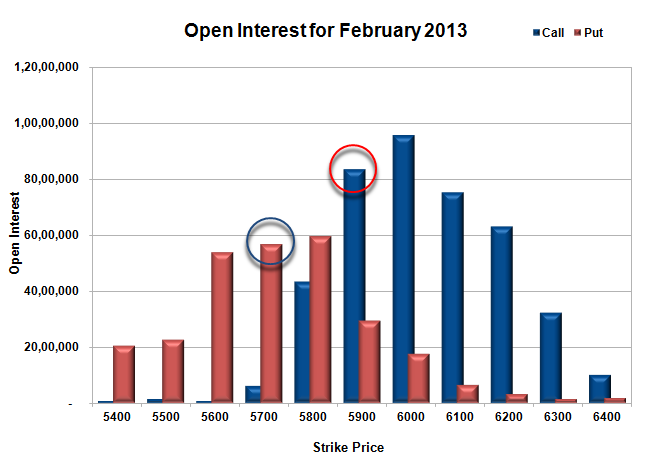 Call option 5700-6000 added 3.89 lacs huge amount of OI with profit booking seen at 6100 and above strike prices. Put Option 5800-5600 added 15.52 lacs huge amount of OI with huge short covering seen at 5900 and above strike prices. Highest accumulation on Call option 6000 at 1.04 crore & 6100 at 83.33 lacs whereas Put option 5800 at 76.34 lacs & 5700 at 61.04 lacs. Nifty Open Interest is at 1,65,60,200 up by 3,86,350 with no change in price, most probably short build-up. 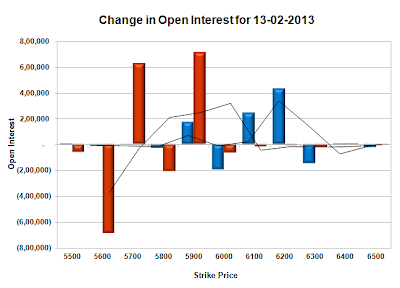 Bank Nifty Open Interest is at 13,29,150, down by 82,800, with increase in price, most probably huge short covering. FII’s sold huge 11.92 lacs of Futures, most probably short build-up, as their net OI increased by 9181 contract and the average price per contract comes to around 5875. FII’s future open contract as on date is 380181. 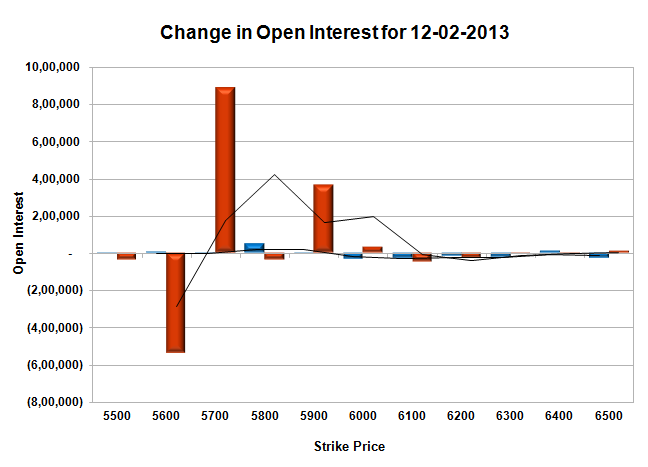 PCR Open Interest (Volume) is still weak at 0.828. Support still very much at 5800PE, with OI above 76.3 lacs and below that at 5700 with OI of 61.0 lacs. Resistance at 5900CE, with huge OI of 60.6 lacs, and above that at 6000 with highest OI of 1.04 crore. 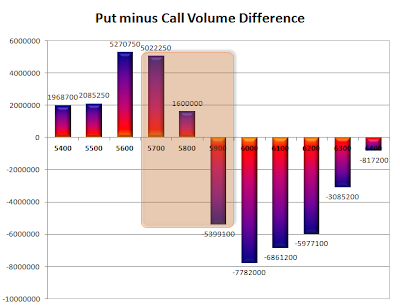 Range as per Option Table is 5815 - 5892 and as per VIX is 5799 - 5902 with 5870 as the Pivot. Nifty opened weak just above 5900, on the back of bad global cues, and further selling saw the index breaking important support levels and closing at the lows of the day at 5852.25, a huge loss of 90.80 points. The broader market was also very weak, with just 316 advances to 1202 declines. The OI table is in a sea of Red, but need to be cautious at lower levels as SMR has gone above 20. 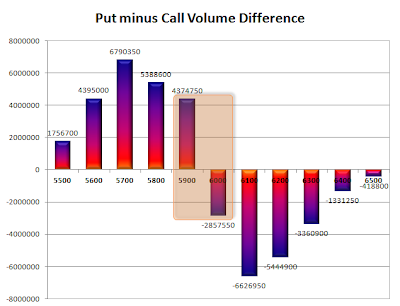 Call option 5800-6100 added 61.80 lacs huge amount of OI with profit booking seen at 6200 and above strike prices. Put Option 5800-5600 added 25.90 lacs huge amount of OI with huge short covering seen at 5900 and above strike prices. Highest accumulation on Call option 6000 at 1.03 crore & 6100 at 87.06 lacs whereas Put option 5800 at 75.87 lacs & 5900 at 53.44 lacs. 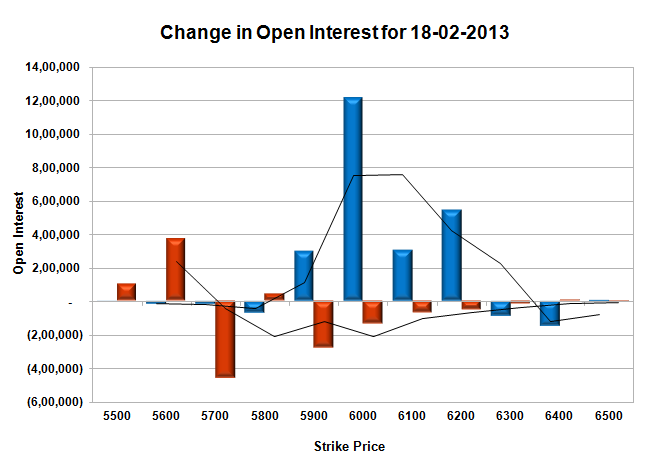 Nifty Open Interest is at 1,61,73,850 up by 1,14,800 with huge decrease in price, most probably short build-up. 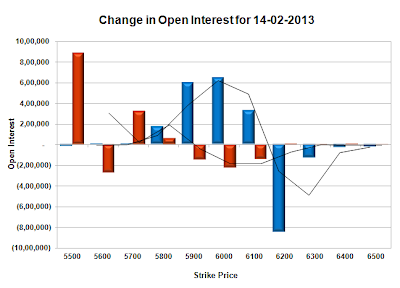 Bank Nifty Open Interest is at 14,11,950, up by 1,31,675, with decrease in price, most probably huge short build-up. FII’s sold huge 8.22 lacs of Futures, most probably long liquidation, as their net OI decreased by 7418 contract and the average price per contract comes to around 5875. FII’s future open contract as on date is 371000. PCR Open Interest (Volume) has gone to 0.810 due to huge liquidation seen at 5900PE. Support has moved down one step and now at 5800PE, and below that at 5700 with OI of 49.2 lacs. Initial resistance now at 5900CE, with huge addition of 20.04 lacs for the day, and above that at 6000 with highest OI of 1.03 crore. Range as per Option Table is 5829 - 5908 and as per VIX is 5800 - 5904 with 5870 as the Pivot. Nifty opened gap-up on the back of positive global cues, but were unable to sustain it and ended the day just above the previous day’s close at 5943.05, a very small gain of 3.35 points. The broader market was just flat to positive, with 788 advances to 696 declines. The 5900PE writers covered some OI, seems like Bulls are not very sure of themselves. 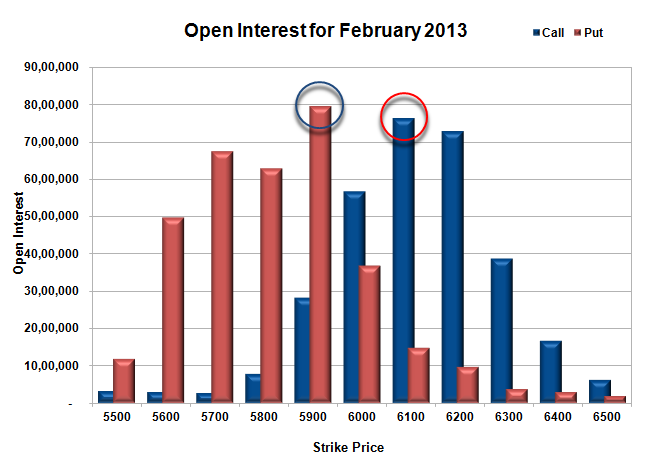 Call option 6200 added 9.73 lacs huge amount of OI with short covering seen at 5800 and below strike prices. Put Option 6000, 5800 added 5.96 lacs huge amount of OI with huge profit booking seen at 5700 and below strike prices. 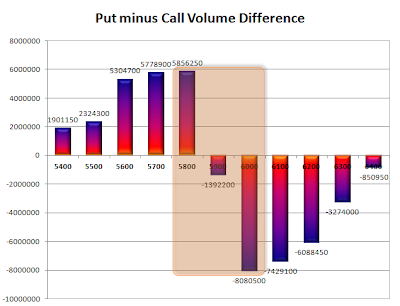 Highest accumulation on Call option 6200 at 83.79 lacs & 6100 at 83.02 lacs whereas Put option 5900 at 70.19 lacs & 5800 at 68.17 lacs. Nifty Open Interest is at 1,60,59,050 up by 2,13,850 with small increase in price, most probably long build-up. Bank Nifty Open Interest is at 12,80,275, down by 7,950, with decrease in price, most probably small long liquidation. FII’s bought huge 6.12 lacs of Futures, most probably long build-up, as their net OI increased by 20800 contract and the average price per contract comes to around 5990. FII’s future open contract as on date is 378418. 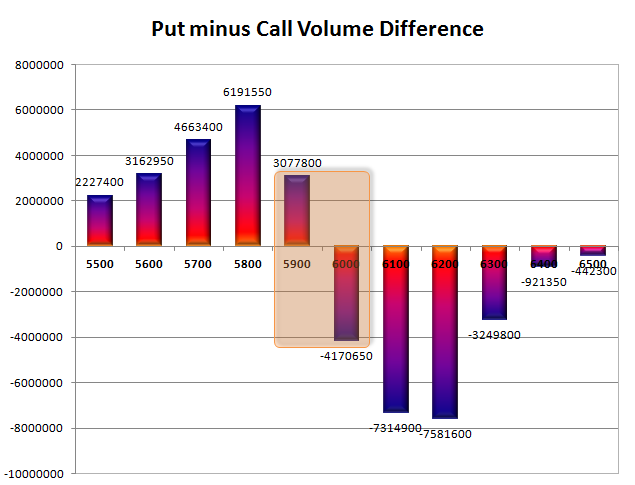 PCR Open Interest (Volume) is still below 1, at 0.911 due to huge liquidation seen at 5700-5600PE level. 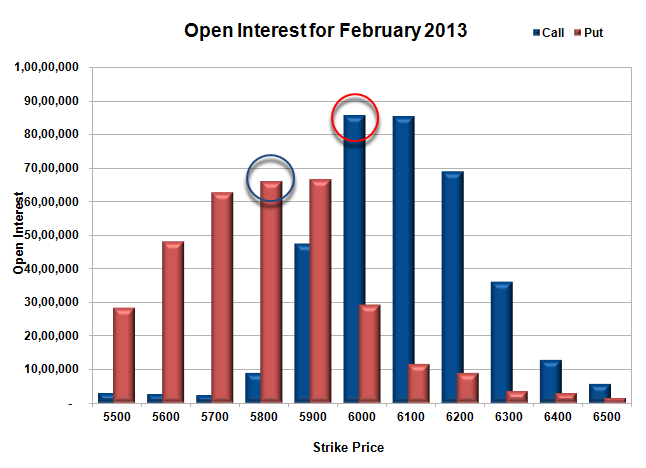 Support still at 5900PE, with huge OI of 70.2 lacs and below that at 5800 with OI of 68.2 lacs. 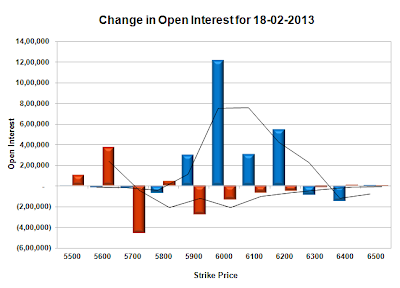 Resistance still at 6000CE, though covered small OI for the day above that at 6100 with highest OI of 83 lacs. 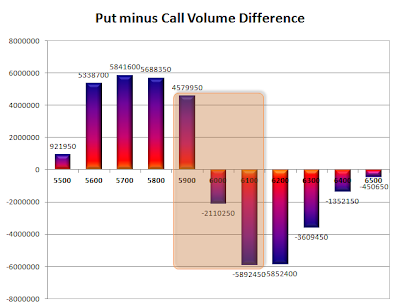 Range as per Option Table is 5911 - 5986 and as per VIX is 5895 - 5992 with 5935 as the Pivot. Nifty opened flat, and meandered around the previous day’s close in a very small range for the better part of the trading session, but saw huge buying in the later half to see the index move swiftly above 5900 to the highs of day around 5950 and closed just below it at 5939.70, an impressive gain of 41.50 points. The broader market was also strong, with 1011 advances to 484 declines. 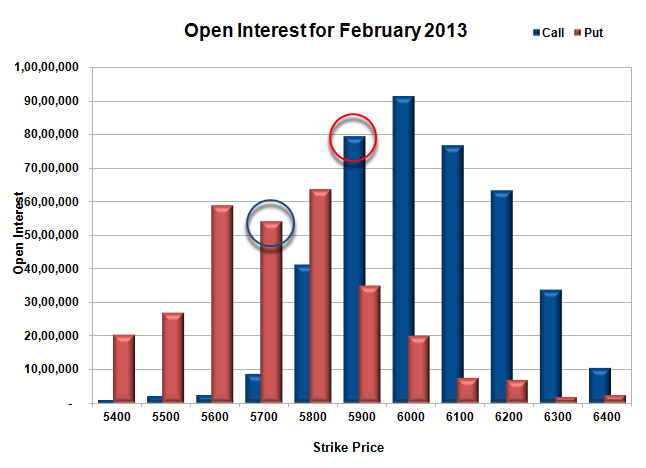 The 5900-6000CE writers covered huge and now the OI table is again open. 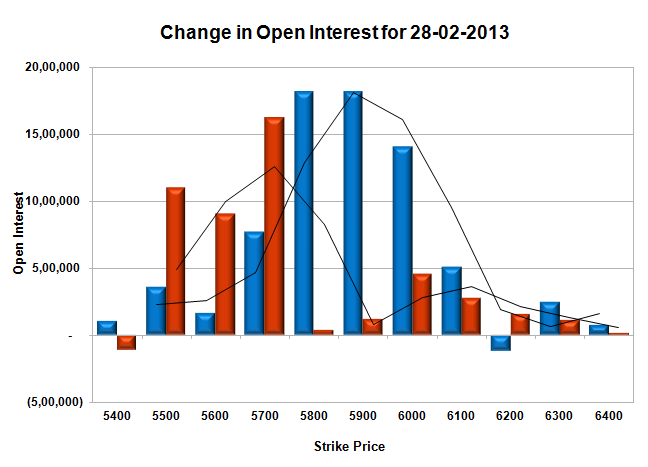 Call option 6200 added 5.08 lacs huge amount of OI with profit booking seen at 6000-6100 strike prices. Put Option 6000-5800 added 5.41 lacs huge amount of OI with huge profit booking seen at 5700 and below strike prices. Highest accumulation on Call option 6100 at 82.99 lacs & 6000 at 76.98 lacs whereas Put option 5900 at 71.39 lacs & 5800 at 66.14 lacs. 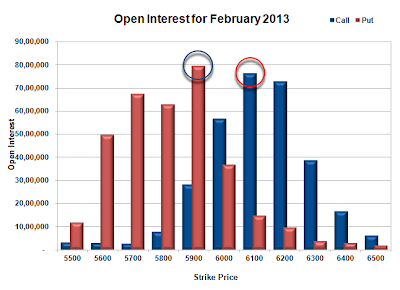 Nifty Open Interest is at 1,58,45,200 up by 4,28,000 with huge increase in price, most probably huge long build-up. 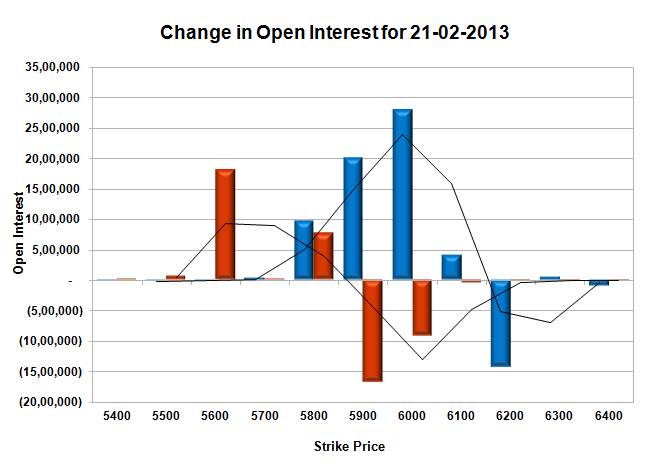 Bank Nifty Open Interest is at 12,88,225, down by 2,500, with increase in price, most probably small short covering. FII’s sold huge 7.10 lacs of Futures, most probably short build-up, as their net OI increased by 12068 contract and the average price per contract comes to around 5984. FII’s future open contract as on date is 357618. PCR Open Interest (Volume) is still below 1, but has increased a bit to 0.973. 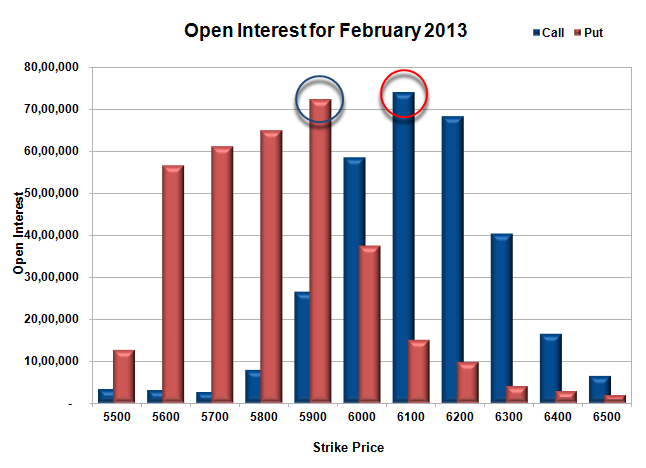 Support back at 5900PE, with huge OI of 71.4 lacs and below that at 5800 with OI of 66.1 lacs. 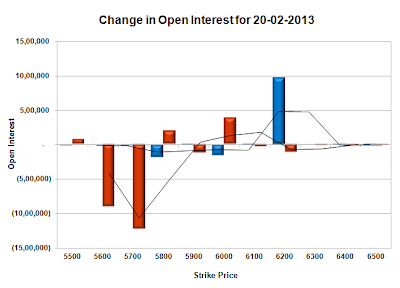 Resistance at 6000CE, though covered huge OI for the day above that at 6100 with highest OI of 83 lacs. Range as per Option Table is 5889 - 5965 and as per VIX is 5891 - 5989 with 5930 as the Pivot. Nifty opened flat, but gained momentum with each passing hour to make a high of 5911, but was sold off in the last hour of trade to close just below the psychological level of 5900 at 5898.20, a small gain of 10.80 points. The broader market was strong, with 906 advances to 592 declines. 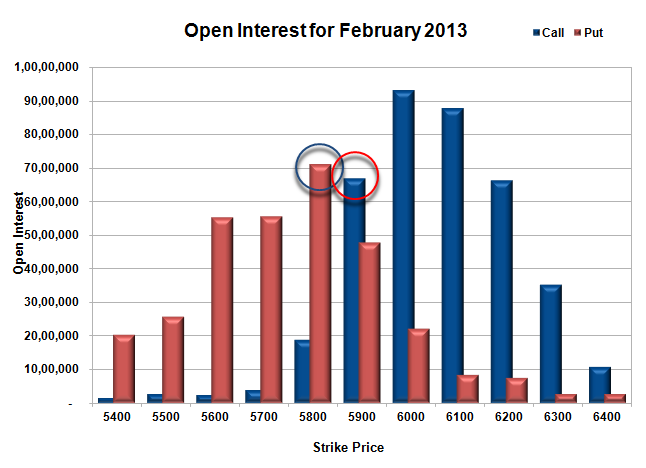 The 6000CE writers added a whopping 12.1 lacs of OI, and now 6000 is the resistance for this expiry. 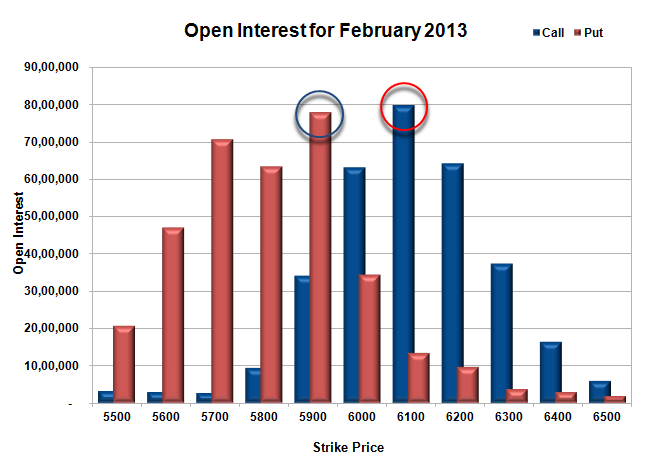 Call option 5900-6100 added 23.66 lacs huge amount of OI with profit booking seen at 6300 and above strike prices. 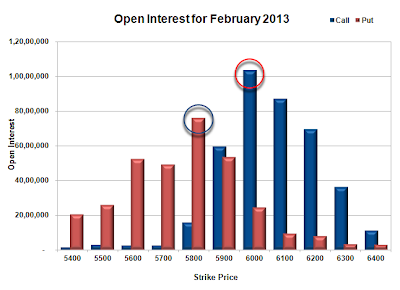 Put Option 5600-5500 added 4.79 lacs huge amount of OI with huge short covering seen at 5900 and above strike prices. 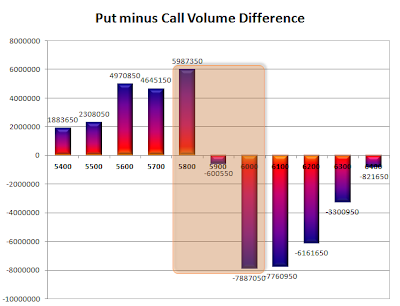 Highest accumulation on Call option 6000 at 85.82 lacs & 6000 at 85.50 lacs whereas Put option 5900 at 66.73 lacs & 5800 at 65.93 lacs. 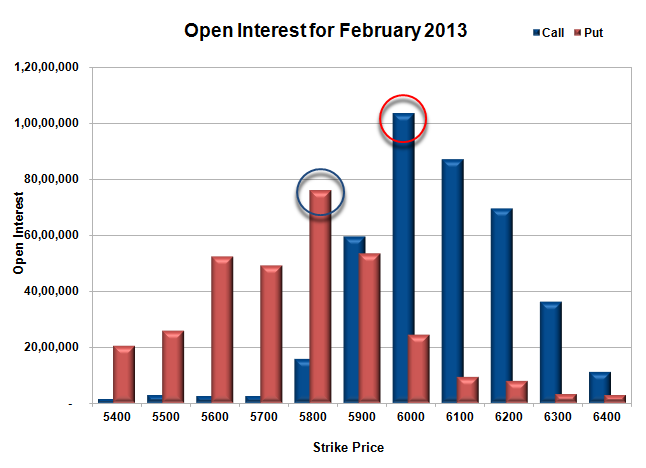 Nifty Open Interest is at 1,54,17,200 up by 6,16,300 with small increase in price, most probably huge short build-up. 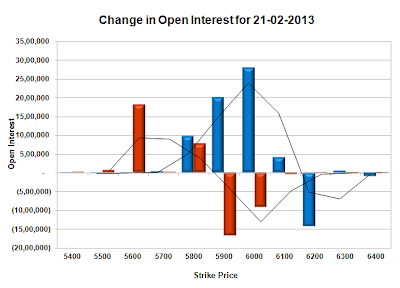 Bank Nifty Open Interest is at 12,90,725, up by 1,01,625, with no change in price, most probably short build-up. FII’s sold huge 6.98 lacs of Futures, most probably short build-up, as their net OI increased by 13443 contract and the average price per contract comes to around 5938. FII’s future open contract as on date is 345550. PCR Open Interest (Volume) has gone below 1 for the first time in the series and now at 0.948. Best support still at 5900PE though price still just below it and below that at 5800 with OI of 65.9 lacs. Best Resistance now at 6000CE, with highest OI of 85.8 lacs and above that at 6100 with huge OI of 85.5 lacs. Range as per Option Table is 5858 - 5937 and as per VIX is 5848 - 5948 with 5905 as the Pivot. Nifty opened weak below the previous day’s close and stayed weak for the major part of the trading session with a pull back towards the afternoon. Nifty touched the highs around 5900, but closed weak at 5887.40, a small loss of 9.55 points. On a week on week basis, this is the third straight week when the index has closed in Red. The broader market was also weak, with just 595 advances to 915 declines. The 5900-6000CE writers added a whopping 20 lacs of OI, and now 6000 could be a huge resistance going into this expiry. Call option 5900-6100 added 23.54 lacs huge amount of OI with profit booking seen at 6200 and above strike prices. Put Option 5800, 5500 added 8.50 lacs huge amount of OI with huge short covering seen at 5900 and above strike prices. 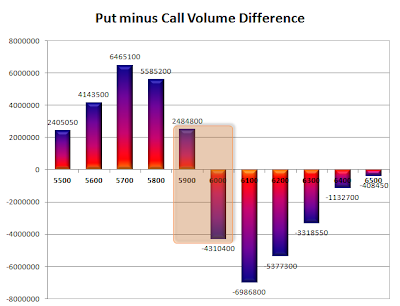 Highest accumulation on Call option 6100 at 82.41 lacs & 6000 at 73.69 lacs whereas Put option 5900 at 69.50 lacs & 5700 at 67.38 lacs. 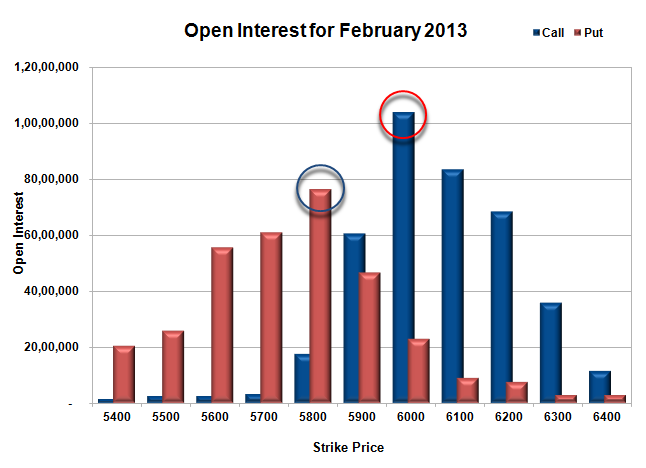 Nifty Open Interest is at 1,48,00,900 up by 7,40,650 with small decrease in price, most probably huge short build-up. 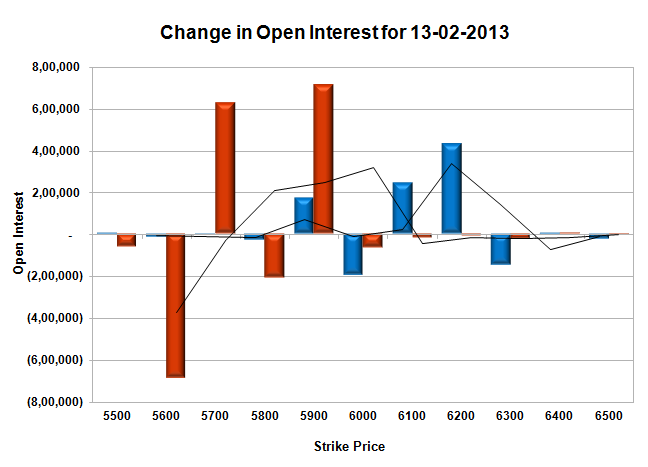 Bank Nifty Open Interest is at 11,89,100, up by 10,450, with increase in price, most probably long build-up. FII’s sold huge 12.68 lacs of Futures, most probably short build-up, as their net OI increased by 26701 contract and the average price per contract comes to around 5926. FII’s future open contract as on date is 332107. PCR Open Interest (Volume) has decreased to 1.015 due to huge liquidation seen at 5900PE level. Best support still at 5900PE but price hovering just below it and below that at 5800 with OI of 65.5 lacs. 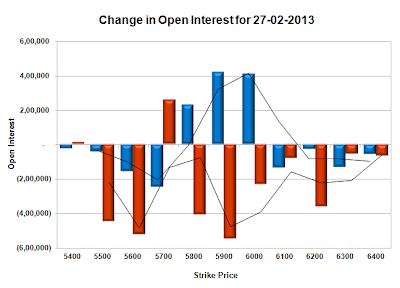 Huge Resistance now at 6000CE, with huge OI of 73.7 lacs and above that at 6100 with highest OI of 82.4 lacs. 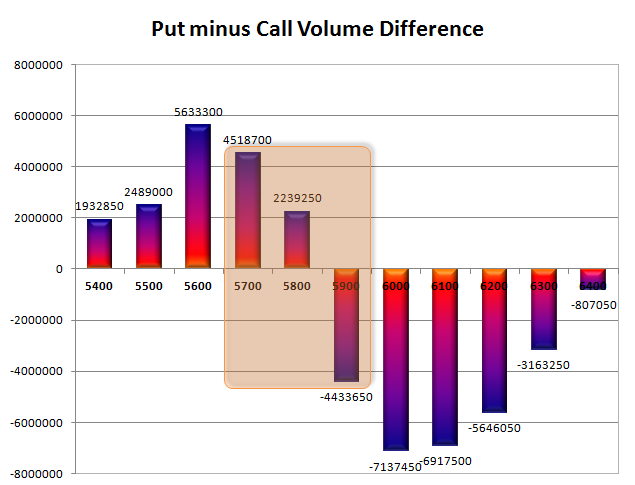 Range as per Option Table is 5845 - 5924 and as per VIX is 5840 - 5934 with 5900 as the Pivot. Nifty opened flat, but was sold off immediately, a better than expected Jan WPI inflation at 6.62% say the market back in green but the euphoria evaporated fast and index went on to make new lows with each passing hour. The index closed near the lows of the day at 5896.95, a loss of 36.00 points. The broader market was weaker, with just 331 advances to 1175 declines. 5900PE OI is still holding on, but need to see how it withstands the resurgent Bears. Call option 5800-6100 added 17.57 lacs huge amount of OI with profit booking seen at 6200 and above strike prices. Put Option 5800-5700, 5500 added 12.67 lacs huge amount of OI with huge short covering seen at 5900 and above strike prices. Highest accumulation on Call option 6100 at 79.78 lacs & 6200 at 64.27 lacs whereas Put option 5900 at 78.04 lacs & 5700 at 70.77 lacs. 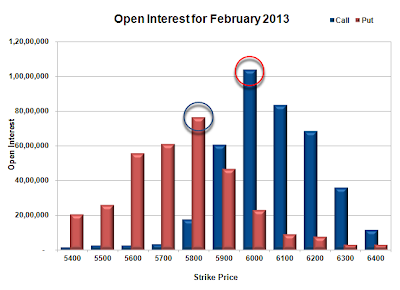 Nifty Open Interest is at 1,40,60,250 up by 6,48,100 with decrease in price, most probably huge short build-up. 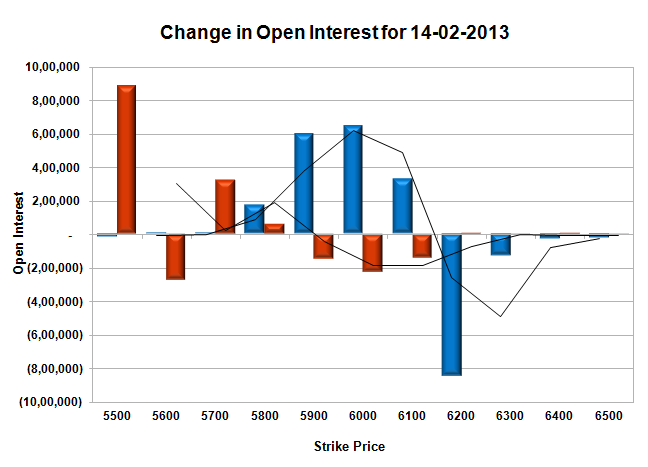 Bank Nifty Open Interest is at 11,78,650, down by 16,625, with decrease in price, most probably long liquidation. FII’s sold huge 6.61 lacs of Futures, most probably short build-up, as their net OI increased by 14511 contract and the average price per contract comes to around 5932. FII’s future open contract as on date is 305406. 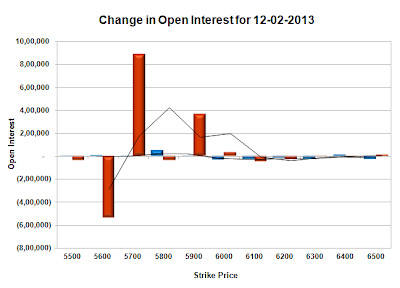 PCR Open Interest (Volume) has decreased a bit to 1.057. 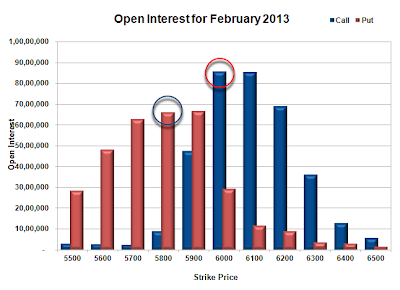 Best support still at 5900PE but price hovering just below it and below that at 5800 with OI of 63.4 lacs. Resistance got better at 6000CE, with huge addition of 6.5 lacs for the day and above that at 6100 with highest OI of 79.8 lacs. Range as per Option Table is 5866 - 5944 and as per VIX is 5850 - 5944 with 5910 as the Pivot. Nifty opened positive, and went up quickly to touch the highs of the day around 5970, but the Sellers were waiting for this opportunity, and gradually moved the index to the lows of the at 5925 to close at 5932.95, a small gain of 10.45 points. The broader market is still very weak, with just 585 advances to 895 declines. 5900PE OI is just below 80 lacs and could be the base for the series. 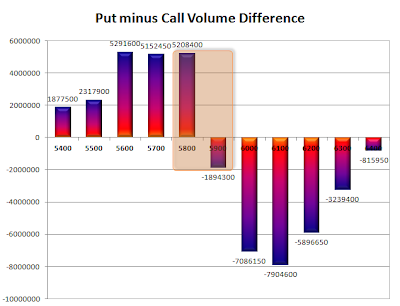 Call option 5900, 6100-6200 added 8.53 lacs small amount of OI with profit booking seen at 6000 & 6300 strike prices. Put Option 5900 and 5700 added 13.43 lacs huge amount of OI with huge profit booking seen at 5800 & 5600 strike prices. 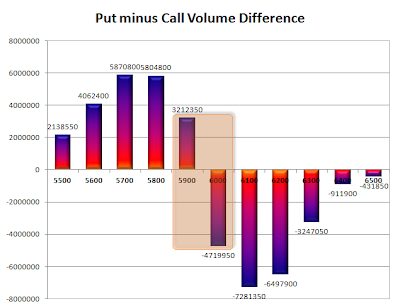 Highest accumulation on Call option 6100 at 76.45 lacs & 6200 at 72.73 lacs whereas Put option 5900 at 79.49 lacs & 5700 at 67.54 lacs. 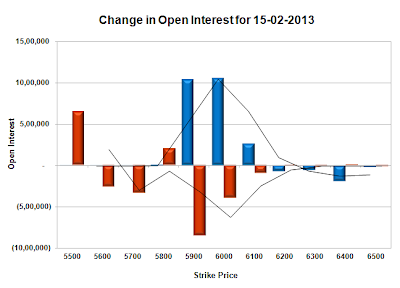 Nifty Open Interest is at 1,34,11,150 up by 70,550 with no change in price, most probably long build-up. Bank Nifty Open Interest is at 11,95,275, down by 14,725, with decrease in price, most probably long liquidation. FII’s bought huge 2.52 lacs of Futures, most probably long build-up, as their net OI increased by 7847 contract and the average price per contract comes to around 5967. FII’s future open contract as on date is 290895. PCR Open Interest (Volume) is at 1.064. Support at 5900PE now looks very good with OI now above 79.5 lacs and below that at 5800 with OI of 62.9 lacs. Resistance still very much at 6000CE, but seems like they are not a confident lot as some liquidation is seen and above that at 6100 with huge OI of 76.4 lacs. Range as per Option Table is 5902 - 5979 and as per VIX is 5886 - 5980 with 5930 as the Pivot.